WHAT ARE THE BEST ONLINE MASTER'S IN HEALTH SCIENCE PROGRAMS? What Else Can I Expect From an Online Master's in Health Science Program? The Bureau of Labor Statistics projects that the healthcare industry will add 2.3 million new jobs by 2024--a faster rate of growth than any other field of occupations in the United States. With a demand for highly-trained health professionals, it is an opportune time to pursue a master's degree in health science. 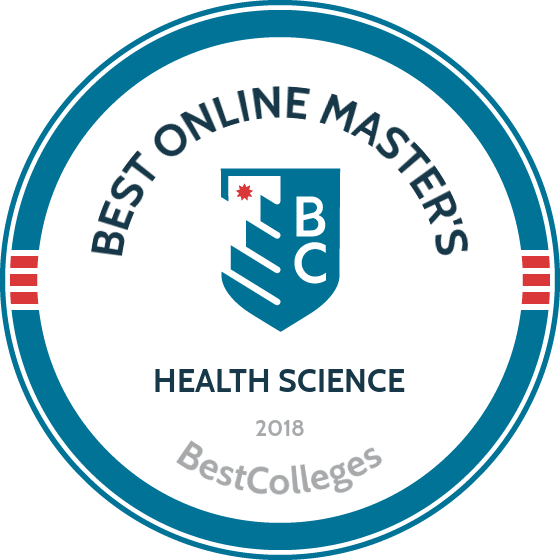 This guide will help you determine which of the leading health science master's programs are the best fit for you--whether you are looking to advance your career or are looking for new skills to better serve those in need. UCF is one of the nation's largest higher education institutions that offers affordable online programs in fast-growing industries like healthcare. The school's executive master’s of health administration is ideal for health management professionals who have at least three years of relevant experience. Graduates from this master's in health science program are prepared for careers as administrators, chief nursing officers, patient safety directors, and risk management directors. This 44-credit program emphasizes leadership, finance, strategic planning, and healthcare trends. Once enrolled, distance learners enter a cohort of no more than 30 students. Each cohort completes the same coursework in the same sequence, including a culminating capstone project. Applicants must have a bachelor's degree with a minimum GPA of 3.0 to be considered. This program is accredited by the Commission of Accreditation of Healthcare Management Education. TUW offers an online master’s degree in health science that is ideal those who want to become healthcare educators. This 36-credit master's degree includes eight core classes and four electives. The curriculum aligns with the standards of the National Commission for Health Education Credentialing (NCHEC) competencies for the Certified Health Education Specialists (CHES) and Master Certified Health Education Specialists (MCHES) certifications; students are eligible to sit for these exams after graduation. This health science graduate degree teaches students how to design and implement community education programs that promote healthy lifestyles. Students also learn data collection and analysis skills that help them identify healthcare education needs and establish appropriate programming. Graduates are prepared to lead communities in their fight against teen pregnancy, HIV, and infectious diseases. Applicants must have a bachelor's degree with a minimum 2.5 GPA and transfer students must have a minimum 2.75 GPA in all graduate-level coursework to be considered. TUW is accredited by the Western Association of Schools and Colleges. NSU offers an online master's of health science program with seven different concentrations: sports medicine, higher education, health law, leadership in healthcare, healthcare risk management, clinical research, and bioethics. Only one concentration (health law) include an on-campus requirement; the rest can be completed entirely online. There is also a joint doctorate in audiology degree. Course requirements vary depending on concentration, with students needing to complete 37-43 credits to earn their degree. Since this program is designed for experienced healthcare professionals, students must have practiced in a healthcare occupation previously to enter the program. NSU expects distance learners to spend 6-8 hours studying each week for each course they are enrolled in. Applicants to NSU's graduate program in health science must have a bachelor's degree with a minimum 2.75 GPA to be considered. NSU is accredited by the Southern Association of Colleges and Schools Commission on Colleges. Rutgers offers an online master's of science in health sciences that is designed to help health practitioners advance their careers. Students can specialize in aging, disease management (Certified Medical Representatives Institute only), or health professions education. They can also tailor their specializations towards their own interests. To meet their specialization requirements, students can earn credit through courses at other institutions, a portfolio, credit by examination, or with an existing post-baccalaureate certificate. All students in this online master's degree in health science pay the same tuition rate, regardless of residency. Students can enroll on a part- or full-time basis and must complete the program within five years. Applicants must practice a health profession and hold a bachelor's degree with a minimum 3.0 GPA to be considered. Rutgers is accredited by Middle States Association of Colleges and Schools. St. Francis offers an online master’s of health science that includes specializations in health education, health leadership, or clinical. The school also offers a generalist option, which requires more than the program’s standard 30 credits. Each of these specializations requires nine credits, and students may pursue more than one specialization if they wish. This health science master's program features rolling admissions, with enrollment opening six times each year. The curriculum includes courses on a variety of topics, such as communication for healthcare professionals, strategies in health policy, ethical issues in practice, and leadership. The program concludes with a culminating capstone project. Courses are delivered asynchronously online, allowing students to complete coursework at their own pace. Students can earn their master's degree in just 18 months and must complete it within five years of matriculation. Applicants must have a bachelor's degree with a minimum GPA of 2.75 to be considered. St. Francis is accredited by the Middle States Commission on Higher Education. Drexel offers an online master's of health science in physician assistant program that prepares students to become new practitioners in the field. The program prepares students to sit for the Physician Assistant National Certifying Examination (PANCE) upon graduation. Drexel graduates consistently boast a higher than average pass rate on the PANCE. The program requires 117-120 credits, beginning with one year of didactic courses followed by 15 months of supervised clinical practice. Students must complete six clinical rotations on topics like medicine, pediatrics, obstetrics and gynecology, psychiatry and behavioral health, surgery, and emergency medicine. Those interested in part-time options or training sites outside of Pennsylvania should contact the school for more information. Applicants must have a bachelor's degree or completed 90 credits of courses with a minimum GPA of 3.0 to be considered. They must also meet all prerequisite coursework requirements and have completed 500 patient contact hours. Drexel is accredited by the Middle States Commission on Higher Education. UTRGV offers an online master's of science in health sciences that is ideal for working professionals. Students may apply to one of four concentration areas: healthcare administration, health informatics, nutrition and clinical laboratory sciences. Graduates from this master's in health science program are prepared to pursue lucrative careers in these fast-growing fields. The program teaches students the skills needed to guide healthcare organizations through large and systemic change and can be completed in just 12 months. The curriculum includes coursework on legal issues, finance, health information systems, and research related to healthcare. This 36-credit program also requires six specific classes in administration. All online students pay the same tuition rate, regardless of residency. Applicants must have a bachelor's degree with a minimum GPA of 3.0, no GRE required. UTRGV is accredited by the Southern Association of Colleges and Schools Commission on Colleges. FGCU offers a 36-credit master's of science in health science program that can be completed entirely online. This program prepares students for a variety of careers in the fast-growing fields of healthcare administration and health education. Students must complete 12 credits of required coursework and 24 credits of electives, allowing them to customize their degree to fit their long-term career goals. The curriculum includes courses on a variety of topics, such as statistical analysis for the health professional, legal and ethical aspects of healthcare, and managerial epidemiology. Students must also enroll in either a culminating capstone course or an internship. FGCU has constructed a mathematical formula for admission that takes into account both test scores and GPA. Applicants must meet the school's academic standards through this formula and submit a portfolio as well as GRE, MAT, or GMAT scores to be considered. FGCU is accredited by the Southern Association of Colleges and Schools Commission on Colleges. ASU offers an online master's of science in the science of healthcare delivery degree that teaches students the skills needed to become leaders in values-based healthcare organizations. This 30-credit degree emphasizes patient-centered care, population health, data analytics, and health economics. Graduates are prepared to pursue careers as healthcare executives, clinical managers, and hospital administrators. The curriculum includes courses on a variety of topics, including healthcare management and finance, process engineering, and healthcare systems and design. The program concludes with a capstone experience, where students undertake a solutions-oriented project in a real healthcare environment. All online students pay the same tuition rate, regardless of residency. Applicants must have a bachelor's or master's degree in a field related to healthcare delivery, such as chemistry, public health, nutrition, or pre med, to be considered. ASU is accredited by the Higher Learning Commission. IUPUI offers an online master's of science in health sciences program that is ideal for health educators and rehabilitation professionals who want to advance their careers. This 36-credit program teaches students problem-solving skills and the nuances of advanced health science trends. The curriculum includes courses on a variety of topics, including rehabilitation theories and applications, theories of health promotion and disease prevention, and design and analysis of of rehabilitation research. Students must also complete research practicums, internships in health sciences, and a number of electives. IUPUI also offers a Ph.D. in rehabilitation and health sciences, which is a natural next step for graduates who want to continue their studies at the doctoral level. Applicants must have bachelor's degree with a minimum GPA of 3.0 and have taken undergraduate statistics or research methods courses to be considered. IUPUI is accredited by the Higher Learning Commission. UCA offers an online master's of science in health sciences that offers both thesis and non-thesis tracks. The curriculum includes courses on a variety of topics, such as epidemiology in health education, biostatistics for public health, and research in health sciences. Students must also pass written comprehensive examinations or submit documentation showing up-to-date CHES certification to graduate. All online students pay the same tuition rate, regardless of residency. Student's in this online master's degree can apply for a graduate assistantship to help offset the costs of tuition. Applicants must have a bachelor's degree with a cumulative GPA of at least 2.7 or a minimum GPA of 3.0 in their last 60 credits of undergraduate study to be considered. They must also submit GRE scores with a minimum score of 3.0 in the writing section, although there are exceptions made for comparable standardized exams, certifications, or undergraduate GPAs of 3.25 or higher. UCA is accredited by the Higher Learning Commission. NAU offers a fully online master's of health science degree that is ideal for working healthcare professionals who want to jumpstart their careers. The master's of administration with an emphasis in health sciences emphasizes management, disease prevention, and developing professional writing and data analysis skills. Graduates are prepared to pursue a variety of careers in the growing health sciences industry, including community health planner, health promotion supervisor, or health services manager. Students can choose one of nine areas of emphasis, including subjects like health sciences, project management, small business administration, and leadership. The 36-credit curriculum includes 15 credits of core administration courses and 18 health science specialization courses plus a culminating capstone project. Applicants must have a bachelor's degree with a minimum GPA of 3.0 and at least 5 years of related professional experience to be considered. NAU is accredited by the Higher Learning Commission. Excelsior offers a master's of science in health sciences program that allows students to choose a concentration in health professions education, public health, or healthcare informatics. There is also a generalist option that does not include a specialization. This master's degree in health sciences boasts a generous transfer credit policy and an eight-week course schedule, making it possible for students to graduate at an accelerated rate. The informatics specialization is comparable to a master's of science in health informatics degree and prepares students to become statisticians, while the public health and education specializations prepare students for careers as health promoters. The 36-credit program consists of 18 credits of health science core classes, 15 credits of specialization courses, and a 3-credit culminating capstone project. Applicants must have a bachelor's degree and submit evidence of education in an allied health field as well as a license to practice in their field to be considered. Excelsior is accredited by the Middle States Commission on Higher Education. ISU offers a master's of science in health sciences with an emphasis in public health that can be completed entirely online. This master’s degree is open to students in all 50 states and Canada as well as U.S. military personnel and their family members having FPO/APO addresses. The program requires 36-45 credits and includes an internship as well as courses in research, epidemiology, and applied communications. Students can choose a thesis or non-thesis option; the thesis option is ideal for those who wish to pursue a doctorate or incorporate further research into their career, while the non-thesis option includes a research project as the culminating capstone experience. Applicants to this online master's degree in health sciences must have a bachelor's degree and completed two semesters of anatomy and physiology plus one semester of college-level algebra, calculus, trigonometry, or statistics. They must also meet minimum GPA standards and have two years of experience in an allied health field to be considered. ISU is accredited by the Higher Learning Commission. Bellarmine offers an interprofessional master’s of health science degree that is ideal for public health practitioners who want to advance their careers. Students can choose a specialization in either healthcare leadership or health promotion and social change. Bellarmine’s degree stands out among health science master's programs for its emphasis on preparing leaders to engage in advocacy and change. The curriculum includes courses on a variety of topics, such as community wellness, program evaluation and statistics, and health policy. Students must also complete a culminating capstone experience. Graduates enter the workforce as healthcare leaders who are proficient in cross-disciplinary collaboration and ethical awareness who are ready to initiate change in any organization. Applicants must have a bachelor's degree with a minimum GPA of 3.0 and completed coursework in applied health science or a related field to be considered. Bellarmine is accredited by the Southern Association of Colleges and Schools Commission on Colleges. The emphasis of master's programs in health science can vary depending on the school and program, but many programs have similar core requirements. This section provides an overview of what you can expect from a typical master's in health science. The coursework required to earn a master's degree in health science is specific to each program, but the courses below outline what students can expect from the average health science curriculum. Research Methods: Health professionals must be able to read and critically evaluate published research. Coursework in research methodologies is integral to initial training and professional development opportunities. Health Policy: Aspiring and current health professionals must understand how policy is made at the local, state, and federal levels, as well as how these policies affect the daily delivery of care in real-world settings. Healthcare Ethics: The healthcare industry contains a variety of ethical dilemmas, including questions of informed consent, parental notification, and efficient resource allocation. It's important for students to have the knowledge to address these concerns. Healthcare Communications: Effective communication is an essential skills for all healthcare professionals. They must have the ability to disseminate the latest findings of a study, work with community stakeholders on new health initiatives, and convey information to patients or clients. Leadership/Management: Students seeking leadership positions need an understanding of personnel and organizational management, supervisory tools and methods, and other fundamentals of human resources. How Long Does it Take to Get an Online Master's in Health Science? Earning your master of health science or master of science in health education typically takes between 18 and 24 months, and some programs allow students up to 5 years to complete required coursework. Generally, master's degrees in health science consist of 30 credits, but students interested in further specialization, like health informatics, may need to complete additional foundational and elective courses. Some schools may require students to join learning cohorts, in which they progress through their coursework on a regular schedule with a group of peers. Other schools offer more flexible, independent learning formats, which allow learners to complete coursework on their schedule. Cohort programs tend to require more time to complete. Accreditation means that a school meets minimum standards and that graduates are adequately prepared for jobs in their field. The most common forms of accreditation are national and regional; regional accreditation is considered more prestigious. Regional accreditation is earned from one of seven agencies across the country that serve the majority of nonprofit colleges and universities in the United States. National accreditation is earned from one of ten agencies that are authorized by the Department of Education (ED). The Council for Higher Education Accreditation (CHEA), a private, nongovernmental organization that represents 3,000 colleges and universities around the world, recognizes six national accrediting agencies. Students should make sure that their online program is accredited by the Council of Regional Accrediting Commissions or by agencies affiliated with the ED and the CHEA, all of which have online databases of accredited school and programs. A master's in health science prepares students for many careers. Graduates of health science programs are prepared for careers as health educators, public health advocates, school nurses, hospital administrators, health service managers, medical assistants, and occupational health and safety specialists. The healthcare field is experiencing tremendous growth, and this means that job opportunities will continue to increase. Below, are five popular master's in health science jobs. Health educators teach people, organizations, and communities about behaviors and practices that improve health and promote wellness. They may also collect data and conduct research on health and wellness issues. Medical and health care administrators work in hospitals, nursing homes, and other healthcare facilities. They plan, direct, and coordinate health services. Environmental scientists promote public health by cleaning up polluted areas, working with policymakers and corporations to reduce waste, and monitoring environmental conditions to determine if a threat to health exists. Dietitians and nutritionists promote health and help manage disease through food. They work in hospitals, schools, nursing homes, and government facilities. With more research showing the connections between food, health, and illness, steady job growth is predicted. Occupational health and safety specialists inspect work environments to ensure that health and safety regulations are met. These specialists work in diverse environments, including offices, factories, farms, and mines. As the table above demonstrates, there are professional growth opportunities for graduates working in the healthcare industry. While the table tracks salary increases based on years of experience, many employers allow the substitution of education for on-the-job experience for hiring and promotions. In looking for ways to pay for your online master's in health science, your first step should be filling out the Free Application for Federal Student Aid (FAFSA). Completing the FAFSA allows eligible students to access Pell Grants, Stafford Loans, and Federal Perkins Loans. Federal grants, work-study programs, and private scholarships, which do not require repayment, are the most preferable options. Federal loans typically offer lower interest rates than private student loans, which should be your final choice. Given the demand for healthcare professionals, many states and organizations are willing to pay for school in exchange for a promise of work.